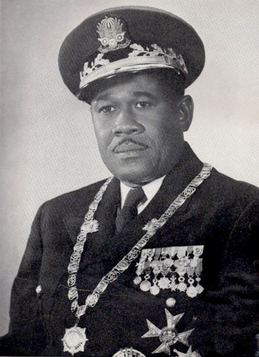 General Paul Eugène Magloire was elected President of Haiti in 1950 with ninety-nine percent of the vote in an army-monitored election and the official support of the army, church, elite, and American embassy behind him. He implemented a successful economic program and oversaw a period of the best economic growth in Haiti in a century, reforming the banking system, attracting foreign investment, fostering tourism, and instituting a Five Year Plan in 1951 to boost agricultural expenditures. In his consolidation of power over the country, Magloire restricted Haitian liberties, jailed dissidents, and actively attacked union organizers. By 1954, soil erosion and deforestation accounted for a decline in agricultural production, which counted for eighty percent of GNP, and Hurricane Hazel ravaged the country, leaving millions homeless and destroying the year’s crop. Although Magloire raised the minimum wage from 3.50 gourdes to 5, the cost of living rose steadily, unemployment increased, and urban conditions deteriorated. Having banned the Marxist Popular Socialist Party (PSP) and Peasant Worker Movement Party (MOP) in December 1950, the regime clamped down further on dissidents as political opposition and economic conditions worsened. In January 1955, Magloire rigged the Deputies’ election so that Daniel Fignolé, a popular political figure, former head of the MOP, and labor organizer in Port-au-Prince, lost his seat in the Chamber of Deputies by an extreme margin. Afterwards Magloire imprisoned Fignolé and closed the Haiti Democratique, a newspaper Fignolé founded. In addition, schools around the country were closed as potential centers of subversion and the Faculty of Medicine dissolved. A discontented populace was further angered when, in advance of the end of Magloire’s term, officially legitimate through December 1956, it was widely misread that May 15, 1956, marked the end of his presidency. Underground radical groups, including the Haitian Revolutionary Committee, surfaced and issued anti-regime bulletins in February, distributing pamphlets to the populace calling for the government to honor term limits and declare general elections. Perceiving that General Magloire refused to relinquish power and call for elections, citizens gathered in protest. The month of May was marked by a series of protests organized by secondary school students around the country. On May 17, students at the Lycée Toussaint Louverture in Port-au-Prince staged a protest shouting for Magloire’s removal: “Down with Magloire! He’s no good! He must go!” They also tore down and burnt a picture of Magloire in the schoolyard. Military police and officers arrived to the scene, appearing in classrooms to beat students and teachers with nightsticks and rifle butts. Secondary school students around the country on the streets of Cayes, Jacmel, and the capital organized protests, issuing anti-Magloire pamphlets, and unintentionally evoking the Revolution of 1946, in which students effectively ousted Colonel Élie Lescot (see, Haitians overthrow a dictator, 1946). Small groups of urban workers supported the students, but were effectively suppressed by police forces. Magloire declared a state of siege and arrested many protesters. Protests were reported throughout Magloire’s remaining year. When his political reforms encouraging the establishment of political parties failed to appease the public, Magloire clarified his intention to step down in 1957, when his term legally ended. The government backed Clement Jumelle, Magloire’s Minister of Finance, as his successor, but François Duvalier, a former official in the Minister of Labor, emerged a significant contender when he declared his candidacy in September. Protests continued, and two leading feminist organizations, The Women’s League and Women’s Union, bravely organized and protested against the government to push for suffrage rights. These women’s groups were indicative of a wider movement around the country, where underrepresented groups increased their pressure on the regime. Only in November did anti-regime campaigns turn to some violence, as when agents of Duvalier placed bombs in public places throughout the country; Duvalier denied associations with the bombings. Lower-ranking officers in the army were largely aligned with Duvalier or Fignolé at this point, and did little to assist Magloire’s regime. On December 4, Magloire banned political meetings, broadcasts, and publications, in addition to arresting hundreds of political opponents. Acquiescing to public opinion, however, Magloire resigned on December 6 and turned over his executive power to the Supreme Court, while he retained his post as commander-in-chief of the armed forces. In a prearranged plan with Colonel Levelt, Magloire forced the Supreme Court to reject the executive power bestowed to them. The resulting vacuum in executive power justified Levelt passing the power of the state back to Magloire, to serve as Haiti’s provisional president. On December 10, business and labor groups organized strikes in reaction to Magloire’s usurpation: bus drivers refused to transport food to the capital, shopkeepers refused to open their stores, lawyers did not accept cases, university students did not attend classes, many children in elementary and secondary school failed to show, and even government employees left work early. In reaction, Magloire paid personal visits to leaders of the business community armed with a Thompson submachine gun, forcing them to sign an agreement that ended the strike. Despite this, the next day shops remained closed in defiance of the agreement, and Magloire, consigned to defeat, resigned again on December 12. A new provisional government was established with Magloire’s departure by self-claimed successor Judge Joseph Nemours Pierre-Louis, and elections were set for May 15, 1957. Feuding presidential candidates and their parties created disorder and delayed the political process. After multiple provisional Presidents were appointed and deposed, Duvalier was elected president on September 22, 1957. Ballard, John R. Upholding Democracy: The United States Military Campaign in Haiti, 1994-1997. Westport, CT: Praeger, 1998. Print. Dubois, Laurent. Haiti: The Aftershocks of History. New York: Metropolitan, 2012. Print. Lundahl, Mats. Politics or Markets? : Essays on Haitian Underdevelopment. London: Routledge, 1992. Print. Parkman, Patricia. “Insurrectionary Civil Strikes in Latin America, 1931-1961.” Cambridge: The Albert Einstein Institution, 1990. Plummer, Brenda Gayle. Haiti and the United States: The Psychological Moment. Athens: University of Georgia, 1992. Print. Smith, Matthew J. Red & Black in Haiti: Radicalism, Conflict, and Political Change, 1934-1957. Chapel Hill: University of North Carolina, 2009. Print.